Last week, my family and I went on holiday to Florida. 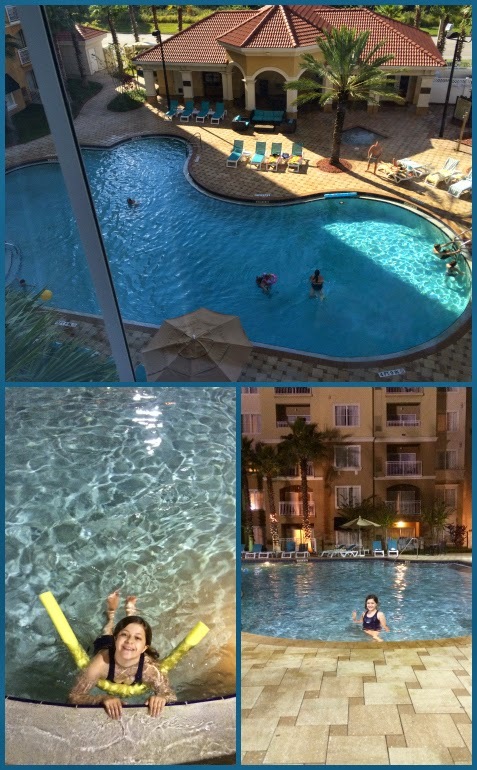 We spent a week in Orlando, staying at The Point Resort, which was a lovely hotel that I would highly recommend. The pool was gorgeous in the evenings when it was all lit up and I was grateful for the hot tub when it got a bit chilly later on! There was a lake outside the hotel with fish, ducks and birds and quite a few turtles that we would go and see each morning. We spent four days at Universal Studios (which was only a mile away and the hotel put on a free shuttle bus). We had loads of fun and the kids got to meet some characters from TV around the park and have their photos taken. My oldest daughter is a massive Harry Potter fan (which is the main reason we chose Universal) so she had a brilliant time at the Harry Potter park. We all really enjoyed The Dr Seuss section of the park (it was my favourite part of the park). It was so bright and colourful and the rides were more geared towards younger children and families and there was a performance of The Lorax too, which my youngest daughter loved. Afterwards, the children (and grown ups!) got to meet the Dr Seuss characters and have their photos taken. Something we all enjoyed was The Simpsons section of the park, particularly the alien ride. Again, the children got to meet some of the characters and we went to Krusty Burger for lunch too. Another highlight for us was the parade, which was fun and bright with lots of dancing and fish on roller skates! Looks amazing! Glad you had a great time!